(Phys.org) —It's been ten years since the bones of Homo floresiensis, aka, the "hobbit" were uncovered in Liang Bua, a cave, on the island of Flores in Indonesia, and scientists still can't agree on the diminutive hominin's origins. This month, the journal Nature has printed a comment piece by Chris Stringer of the Natural History Museum in London and two pieces by Ewen Callaway, one a retrospective with interviews with the central players, and the other a podcast with the four principle scientists involved in the find—Bert Roberts, Thomas Sutikna, Dean Falk, and Stringer. Did H. floresiensis descend from Australopithecus, leaving Africa and somehow settling on Flores, or was it a case of an early member of our family tree finding its way to the island and then because of limited resources, evolving into a much smaller size? That's the central question in the debate. The majority opinion has sided with the island effect, mostly because of the time frame— H. floresiensis existed a mere 13,000 years ago, which means it was alive when other Homo sapiens were about, thus it seemed to make sense that H. floresiensis was also a member that had become stranded on an island. But Stringer doesn't agree. In his commentary piece he notes the chin and jaw are more reminiscent of pre-human fossils, dating back approximately two million years. Also the body shape and tiny brain appear to be more primitive than humans. He says taken together, the evidence suggests a closer match with Australopithecus, a pre-human group living in Africa which also includes the remains of the famous "Lucy"—and which also date back to approximately 1.2 million years ago. But that would mean that some members of that ancient tribe would have had to travel a long way over the ocean to reach Flores. Stringer notes that another event that occurred ten years ago, offers evidence of just how that could have happened—the Indian Ocean tsunami that carried people atop debris for more than 150 kilometers. 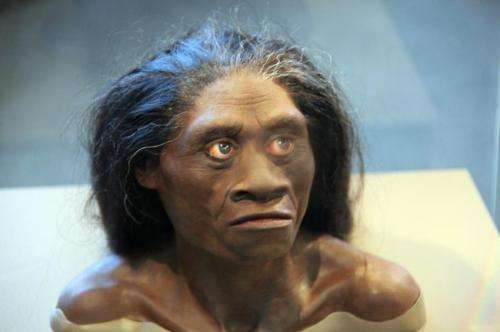 If that were the case, he wonders if other evidence of H. floresiensis might exist on other nearby islands. Much more research still needs to be done to settle the debate—if other fossils are found that contain DNA evidence, for instance, that would surely help. I've always wondered why we should assume this is a typical skeleton of a typical Homo floresiensis and not simply an abnormally small specimen. Or abnormally large for that matter.